When traveling to Morocco, why not buy a bottle of the precious Argan oil. It is a rare specialty of the country said to have many positive nutritional and medicinal effects. But be aware. Much of what is offered in the markets may not be the real thing. The oil is extracted from the fruit of the Argan tree (Argania spinosa, syn. A. sideroxylon) a very hardy tree growing in Morocco. This is a tree with roots back to the Tertiary era, and has been brought close to extinction. Thanks to conservation efforts arganeraie forests now cover some 8,280 km² and argan oil has become a considerable source of income of growers. Argan oil contains natural tocopherols (vitamin E), phenols and phenolic acid, carotene, squalene, essential fatty acids, 80% unsaturated fatty acids and depending on extraction method more resistant to oxidation than olive oil. Argan oil is used for dip, on couscous, salads and similar uses. It is also a vital ingredient in "amlou" a thick brown paste with a consistency similar to peanut butter produced by stone grinding roasted almond and Argan oil. It is considered a favorite local bread dip. The unroasted oil is traditionally used as a treatment for skin diseases, and has created considerable interest in the cosmetics industry. You may find bottles labeled argan oil all around Marrakech. We discovered that buying the thing on the street may be a bad idea, as these bottles may contain a blend of Argan and other oils, or even nothing of the precious oil. We were tempted to enter Herboriste El Andalouss by Mosquee El Mansour in the Kasbah district. This seem to be the place to buy the thing, as he had an extremely large selection of different remedies in his very clean and neat shop. Susanne, my travel mate, bought Argan oil and interesting seeds that if placed in a piece of cloth and rubbed, released oils relieving congested sinuses. I bought two plastic bags of Ras el Hanout and harissa. 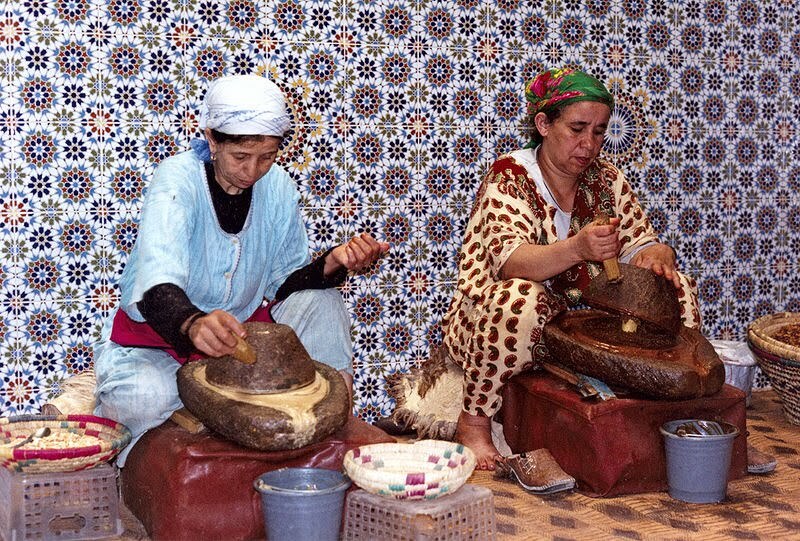 If buying Argan oil in Marrakech, I strongly recommend a visit to a herborist as the one in the Kasbah district. Do ask on your hotel where you may safely purchase this precious oil.